With CSS, you can provide style to the display of elements on your blog (such as text links, header images, font size and colors, paragraph margins, and line spacing). CSS selectors contain names, properties, and values to define which HTML elements in the templates you will style with CSS. CSS selectors are used to declare (or select) which part of the markup the style applies to. 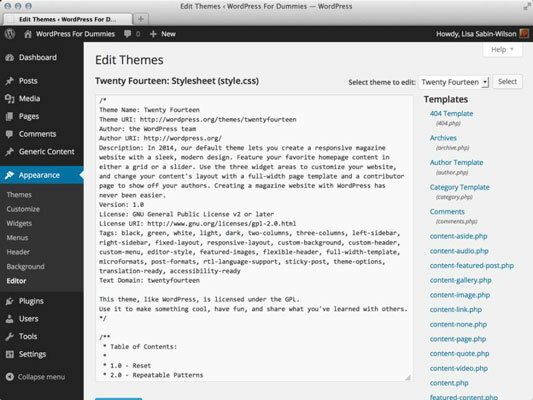 IDs and classes define styling properties for different sections of your WordPress theme. Take a look at the examples of IDs and classes from the header.php template in the Twenty Fourteen WordPress theme. Armed with this information, you’ll know where to look in the stylesheet when you want to change the styling for a particular area of your theme. id=”site-header”> #site-header Styles the elements for the site-header ID in your template(s). class=”search-toggle”> .search-toggle Styles the elements for your search-toggle class in your template(s). id=”primary-navigation”> #primary-navigation Styles the elements for the primary-navigation ID in your template(s). CSS properties are assigned to the CSS selector name. You also need to provide values for the CSS properties to define the style elements for the particular CSS selector you’re working with. In the default Twenty Fourteen WordPress theme, the markup on line 36 in the Header template (header.php) is <div id=”site-header”>. This ID, with the name site-header, provides styling for the site header. The first CSS property is position, which has the value of relative;. The second CSS property is z-index, which has the value 3.